The answer to stopping wildfires is here, thanks to our climate change denier in charge. The key to halting these fiery infernos threatening California is...wait for it...raking up the leaves beneath the trees! As Trump tramped through the ashes of the lost town of Paradise Saturday, he claimed there were no forest fires in Finland because they raked up all of their leaves. Even the most casual listener would challenge that idiotic explanation. Flanked by the outgoing California governor, Jerry Brown, and the incoming governor, Gavin Newsom, Trump waddled through the ashes and didn't listen to a word of explanation about the real causes of wildfires in California. Using his tiny expressive hands for emphasis, Trump conceded that climate change might bare a little responsibility, but...and the rest is unintelligible trash he's dreamt up in his alternate universe. The irony of having a political fire-starter for a POTUS discussing raging infernos anywhere is unsettling. 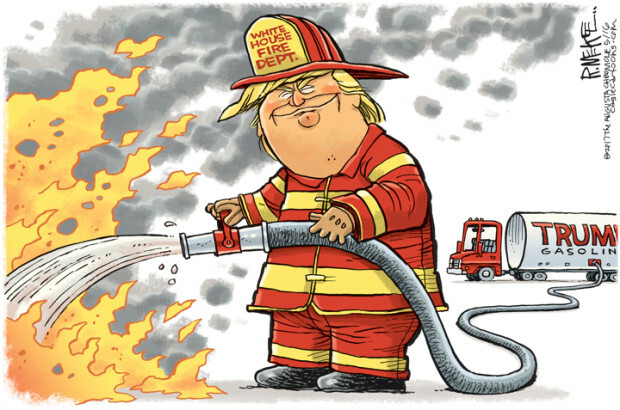 At one point Trump even threatened to withhold federal funds for California fire suppression if they didn't use "better forest management," once again demonstrating how uniformed he is. Perhaps the best example of what a political fire-starter Trump is the reception he got going into Paradise from survivors living alongside the road, when his motorcade passed by. In an almost surreal confrontation after such devastation it was the non-Trumps vs the Trumpies. People went nose-to-nose exchanging incendiary insults as Trump's motorcade blithely went by. I can't help wondering how these survivors - who were all in the same boat - were getting along until Trump's tour.